Yogurt, spices and nuts. Elegant, naughty and basic. 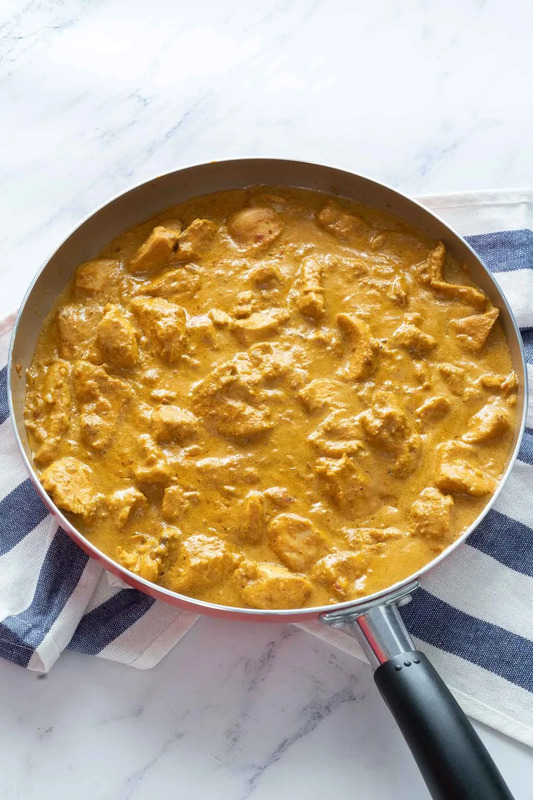 This Chicken Korma recipe actually reminds me that one time when all we wanted was an easy prepping and no hair-triggered meal. This one is just the cracker, folks. Yes, Korma is a Curry dish which is rooted in North India. Derived from Urdu culture, it’s also known as qorma, khorma, kurma, kormah or qovurma, which all mean “braise” – pretty obviously to tell about the technique employed to make this dish. Developed on the Mughlai cuisine, Chicken Korma truly depicts the traditional regional culinary custom of North India, as its distinctive flavor always varies from extremely mild to spicy hot – thanks to the combination of fresh spices. Mughlai cuisine consists of all the entrees and main courses where the meat is brought to moist heat and then slowly cooked with liquids (meat broth or water) after being seared over high heat. These dishes usually call for plenty of other side items. So, much as I can tell, Chicken Korma shows no huge differences at all. Its richness is also braised from both the creamy paste and the earthy kicks of spices and veggies. What is in Korma curry paste? Korma sauce is a thick gravy, curry paste made from Greek yogurt, tomato paste, fresh ground spices, pureed almonds and then lightened with Greek yogurt or creams. For Korma Chicken, the fiery aroma of curry dishes is still there, but no longer accompanied by the crazy hot heat spiciness (God bless you, those with spice intolerance). You can always make second thoughts about adding chilli in later. It’s indeed an incredibly easy and delicious dish, especially when siding it with freshly chopped chillies and steamed rice or naan. Additionally, dry fruits like raisins or other kinds of nuts like cashew are most likely favored if a lightly mild and sweet sauce is what you’re aiming for. I must say the long list of spices for Chicken Korma and the amount of fat within the dish do vary customarily, from household to household at least. And yet, I wouldn’t suggest you to dumb your ingredient list down too far (same as this Oven baked chicken breast thing that I’ve been so wordy about recently hehe). Fat is the very bare essential for the flavors of this dish, so don’t you ditch it – or else you could call it anything but ‘Chicken Korma’. As per Asian-accustomed way of experiencing food, chilli powder is often included too. But stay sane – you could totally make it a lighter curry by limiting the spicy garam masala and paprika while doubling the veggies instead (carrots, potatoes and so on – you name it). So as a mama’s rule once went, "You are what you eat, so don't be fast, cheap, easy, or fake." I went set my bars high for this easy dish, only to find out simplicity is the ultimate sophistication. A hole in one, yes it is. Add all the ingredients for the sauce into a food processor, turn on at high speed to puree them until completely smooth. Put the chicken chunks in a large bowl, pour in the above mixture and stir well. Cover with cling film and put it under refrigeration for at least an hour. Melt butter through the canola oil over medium high heat on a skillet. Sauteé the chopped onions for 5-7 minutes until caramelized. Add the chicken thigh meat to the skillet and cook for 15 minutes. Make sure to cook them through completely. Continue to pour in heavy cream and keep stirring for another 4 minutes so the chicken absorbs the juice perfectly. You should get the marination set for at least an hour, so manage to prep it before work or better still, a day ahead. It’s very easy for the spices to get overly-toasted and give your Korma Chicken an unpleasant bitter flavor. You can avoid the problem by going for fresh whole spices. I made this dish this past weekend and it came out wonderful. I’ve made korma before where it was so labor intensive and this was so not labor intensive which was so convenient and easy and still had all the heavenly korma flavors that are tasty. Next time I make it, I will try it with light coconut milk instead of yogurt and switch out the almonds for cashews. Thanks so much for this wonderful yummy appetizing flavorsome dish.